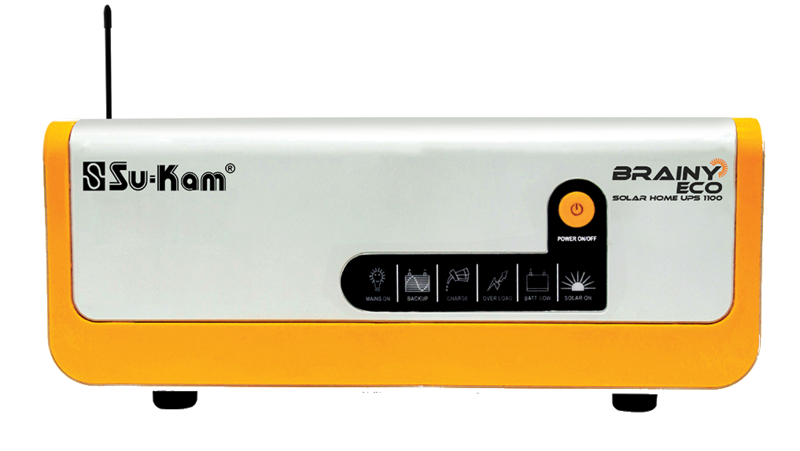 Su-Kam is amongst the largest inverter manufacturers in India. The scompany has been known for manufacturing the first sine-wave inverters and launching plastic body for inverters. The company has sales network in more than 70 countries worldwide. These inverters are no longer boxes that convert energy into electricity, they have come a long way with features like automatic temperature compensation, 6 Stage Charging, touch screen and are wi-fi enabled. Su-Kam’s Brainy Eco Inverter is a hybrid solar inverter that is perfect for every home, as it can charge both through grid and solar. The Brainy Eco inverter system works efficiently and smartly to manage the laod in a house. For example, if the appliance in our home requires 300 W of power for running and the inverter system gets 500W from the solar panels installed, it will conserve the extra 200W of power and store it in the batteries or charge batteries, for use at a later time when solar power is not available. This helps in saving on teh electricity bills. The system is designed in such a way that the Brainy Eco will use one source at a time – either solar energy or the grid. The Su-Kam home solar inverter system comes with an “Intelligent charging sharing” feature, which means that it will not overcharge the batteries. There is a switch which can be used to cut the power supply from the mains, so as to further save on the electricity bills. This saves batteries charging from the power grid mains. This fetaure is not available in any other normal off grid solar UPS. So this home inverter system gives you the best of both the worlds. Although Brainy Eco is a hybrid solar inverter, it also gives you the option of disabling grid charging completely, which leads to huge saving on the electricity bills. It also has an in-built 30 amp solar charge controller. It comes with six stage charging and ATC (automatic temperature compensation) technology, which prevents the battery from overcharging thus improving the battery’s life in turn (by 6 months). The inverter system is designed in such a way that it goes into band restarts itself after 3.5 minutes, whenever there is a high voltage emission. It also comes with a ‘PV Reverse‘ indicator that glows, indicating that the solar panels or batteries have been reversely connected. Brainy Eco is also equipped with a MCB switch at the back, which trips in case of short circuit or overload, keeing the system safe. The system is capable of charging in low volatge conditions, when most of the inverters go into a backup mode. The inverter is also flexible enough to be used with batteries of any size from 18AH to 150AH. Su-Kam inverter system are costly when compared to a normal sine-wave inverter. But its benefits lasts long. The most important benefit of using a solar home system is that though the initial cost will be more, its benefits will be more in the long run. You get to use free solar power and cut on our electricity bills. These systems are highly recommended for people living in places with high solar radition and huge power cuts. You can buy this intelligent home UPS system on Amazon here. Or you can contact the customer care in Su-Kam. I was searching a review of this inverter thus got your blog. Nice to know more about it and planning to buy but have a question also whether it and be charged through grid only? because I planning to buy only inverter and battery for now and will get solar pannel latter.